Yes, the marvellous debut actress Elizabeth Debicki is cruelly underused in the film. They cut out her all important final scene (but the deleted scene does exist, and she is flawless, so we'll pretend that it is still a part of the film). Of all the actors in the film, she has her character so incredibly aligned with F. Scott Fitzgerald's description. 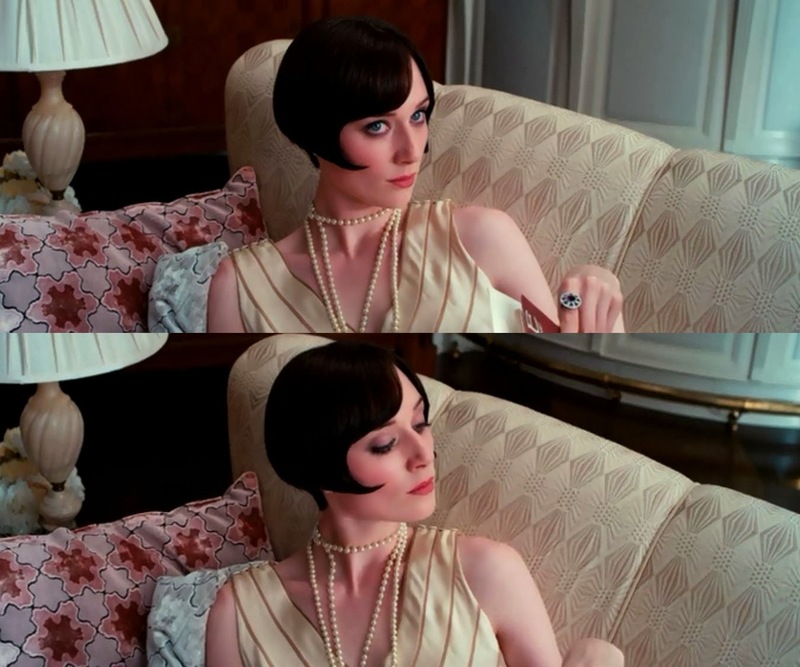 In fact, the part where Jordan is described is pretty much my favourite example of Fitzgerald's writing (apart from the amazing final lines), and to see Debicki pull off those few moments so flawlessly ensured that I would love the film. Debicki just fits so perfectly into the time period, with her look and her voice, shedding off the feelings of imitations that plagued Carey Mulligan and Joel Edgerton. I'd be happy if we had a whole film of just her and her poor driving skills, lies about leaving the car roof down and her adventures through golfing. Unfortunately, we didn't get that, but one can only imagine what kind of talent Debicki would have brought to the table. Her vibrance is something that I look forward to seeing in the future. But one can't forget: Leonardo DiCaprio as Gatsby. He's (supposed to be) getting buzz for The Wolf of Wall Street, and the Best Actor race is damn over-crowded this year, so any chance of him getting proper recognition for his work as Gatsby is slim. Alas, he fits Gatsby like a glove, perfectly portraying Gatsby's fantastical dreams and self-built delusions. Would have been interesting to see how he'd have fared if the film was released closer to awards season (probably not well, knowing his track record). ...another person reluctantly put at hero status. And also another person who has a better chance with American Hustle. But Jennifer is wonderful in this film, navigating the tricky business of being Katniss Everdeen with more fluidity than she showed in the first film. She truly does make this teen franchise one of a high calibre. Why isn't this getting more love? Sure, Bejo won the Cannes award for Best Actress, and rightly so, but the love seemed to stop there. She plays one hell of a character, and is probably one of the "strong female characters" that actually deserves that paper thin title. She's flawed, frustrating and ferocious, and definitely a far cry from the preppy Peppy Miller from The Artist. Due credit should also go to Asghar Farhadi for another thrilling screenplay that uses words as weapons. This film, though released very early in the year, is still one of my absolute favourites. It is so twisted, evoking this Hitchcockian feel that many modern thrillers lack. One of my favourite things about this film was the chilling performance by Rooney Mara, who played one of the more twisted and complicated characters of the year with surprising ease. If Lisbeth Salander had be terrified of Mara, then Side Effects definitely gave me another reason. For one thing, and one thing only: the pink skies that light up some of the scenes in the film. Makes a grimy gangster flick as slick as a Terrence Malick film. Spring Breakers deserves points for being the most colourful, most out there film of the year, but I'm pinning my hopes on a cinematography nomination, because this film was an unsettling feast for the eyes. Mette has some love for Spring Breakers and the categories it should be nominated in. Which includes Best Nail Polish. Josh makes the case for everything, with an outsider for every category at the Oscars. How I'd love for Before Midnight to get a Best Picture nom! Brittani makes the case for The East, a movie which I'm still desperate to see. ILY, Brit Marling! While Gravity is sure to get a lot of love, one person who will probably come out awards season without any recognition is George Clooney. Sati tells us why he should be up there with the party. Andy has a case to make for Stoker, and the several categories it should be nominated in (a big yes for a Nicole Kidman nom). And Nikhat went beyond the call of duty and had three cases to make: a case for comedy, a case for Tye Sheridan in Mud, and a case for Greta Gerwig in Frances Ha. Considering I've seen all of the films she's made a case for, major hearts for all of them. There were only a few entries, so if you wanna get your entry in, tweet at me (@SteveeTaylor) or email it to me (steveetaylor[@]hotmail.co.nz). For now, who is an outsider that you're most rooting for? I thought Elizabeth Debicki was ab fab but god, such less scenes :( And I looved Leo, like duhs. Oddly enough, from The Past, my favourite performances were the daughter's and the little kid's. I thought they were amazing and will probably feature in my favourite performances list whenever I make it. And yes, if Gravity does not get Cinematography, I want Spring Breakers to get it. Oh I do love the kids in The Past! What a tough job they had, but they pulled them off so well. Great choices. I really need to give The Great Gatsby another look, and I still haven't seen The Past. Though, Cooper, Lawrence and Mara are wonderful, and Spring Breakers' cinematography is fantastic. It seems very unlikely now that the Golden Globe and Independent Spirit nominations have come out, but if James Franco was somehow nominated for Best Supporting Actor for his performance as Alien in Spring Breakers, it was be really awesome :) I also think that Spring Breakers deserves a nomination for Best Cinematography.